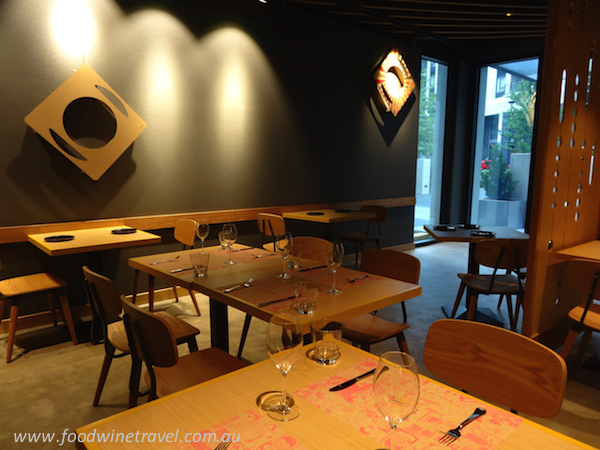 LiLoTang is a hip new Japanese eatery that has opened in Canberra’s Hotel Burbury. 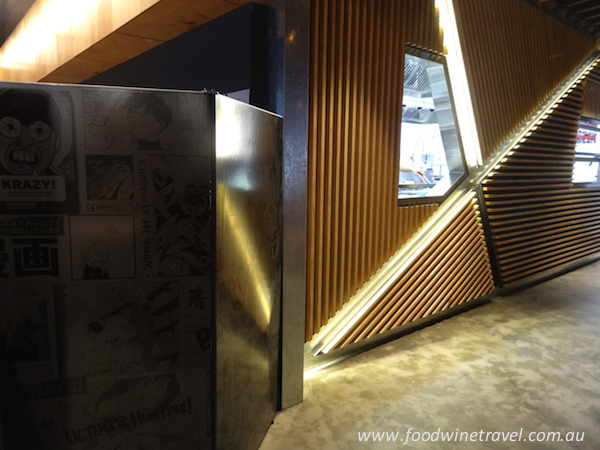 Although the food pays homage to traditional Japanese cuisine, the restaurant has a young vibe with lots of references to Japanese anime and pop culture, an eight-metre bar and lounge seating. 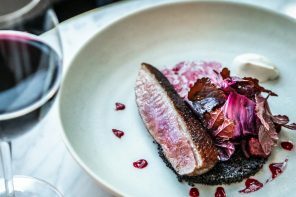 Josiah Li, who has opened LiLoTang with the help of Po Yang Chia, already operates Malamay in the Hotel Burbury, The Chairman & Yip in downtown Canberra and the Lanterne Rooms in suburban Campbell. 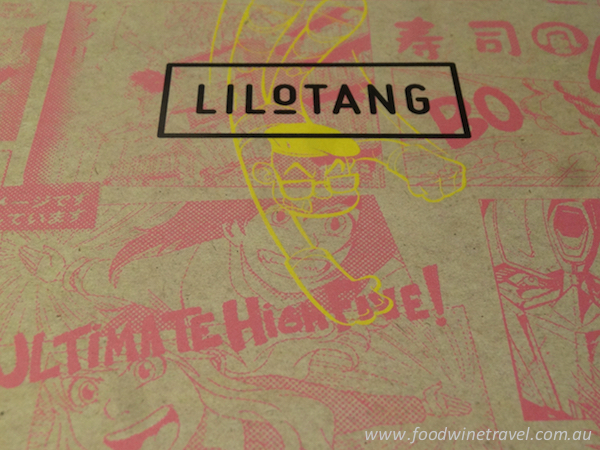 Li says LiLoTang has a younger vibe than the other Chairman establishments, and indeed it does a great job of straddling the divide between casual and formal. Overlooking a courtyard in the Hotel Realm precinct, the restaurant has concrete floors, minimalist furnishings and blonde timber surfaces, the end result relaxed enough to welcome someone in shorts yet sophisticated enough to welcome a group celebrating a significant occasion. But enough about the décor, let’s look at the food. The menu could best be described as part way between kaiseki, the Japanese style of fine dining, and izakaya or pub dining. The dishes are designed to be shared as part of a multi-course meal. Po met executive chef Shunsuke Ota while working at Nobu in Melbourne and encouraged him to make the move to Canberra to open LiLoTang. Shunsuke came to Australia a bit over three years ago but hails from a traditional Japanese family, his grandfather still farming premium quality rice back in Japan. Those Japanese traditions resonate strongly in the LiLoTang menu, with numerous classic dishes, such as chicken yakitori, sitting alongside lesser-known dishes, such as roast umami vegetables served in a hollowed-out orange. The yakitori is cooked on the restaurant’s shiny new robata grill, which allows the food to be cooked at an extremely high heat over Binchōtan charcoal (Japanese oak). 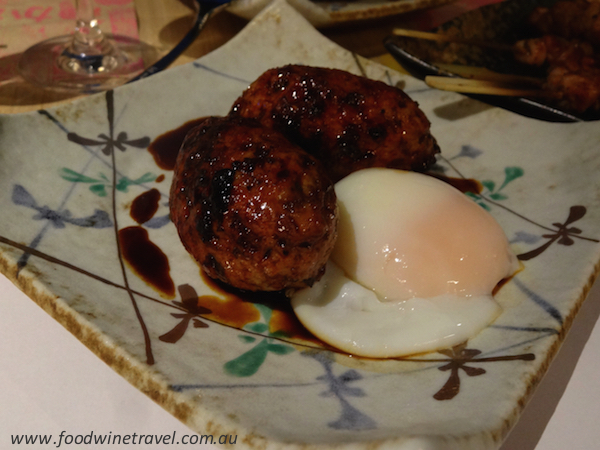 It is served with what is described on the menu as “inherited homemade yakitori sauce”, a reference to the fact that the recipe comes from the chef’s grandfather. 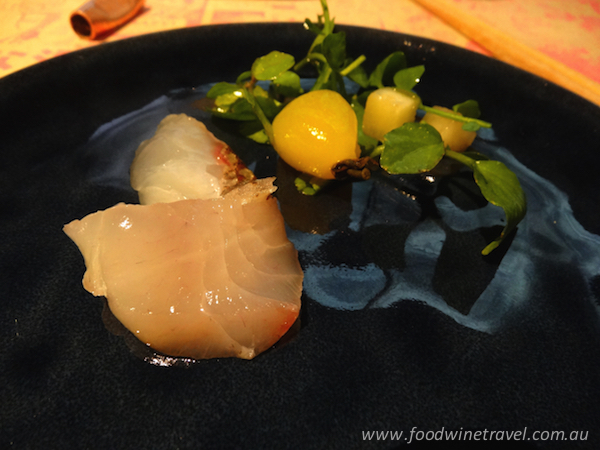 Umami-jime snapper sashimi with white peach, heirloom tomato and watercress. The umami flavour comes from the combination of konbu, soy sauce and dashi used to cure the snapper. Love the peach and tomato combo. 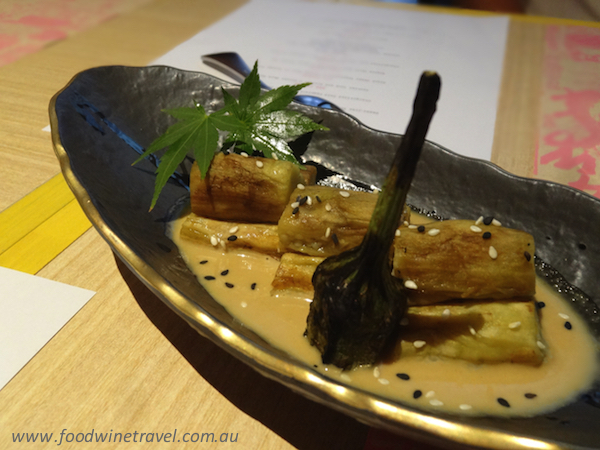 Chargrilled cold eggplant with creamy sesame sauce. A smokin’ good dish. The eggplant is chargrilled with the skin on. 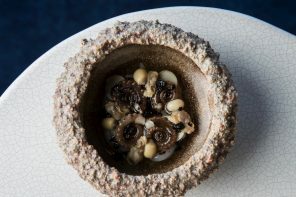 After the skin is removed, the smoky-flavoured eggplant is smothered with a creamy sesame sauce and black sesame seeds. Sashimi tuna and avocado with wasabi okra soy. 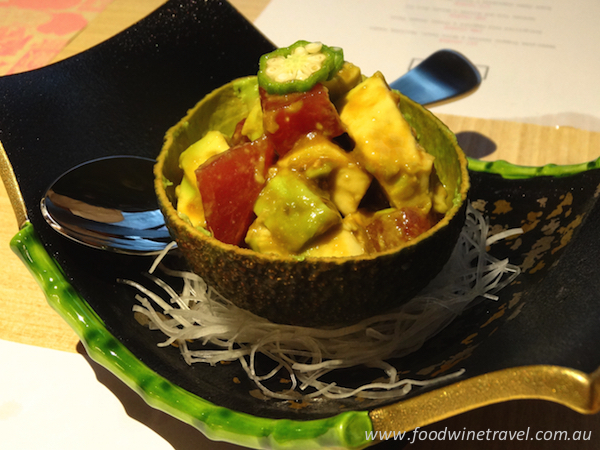 Avocado and tuna complement each other perfectly in this very simple dish, which is served in an avocado shell and given a unique twist with the addition of okra. Roast umami vegetables with orange miso in orange pot. 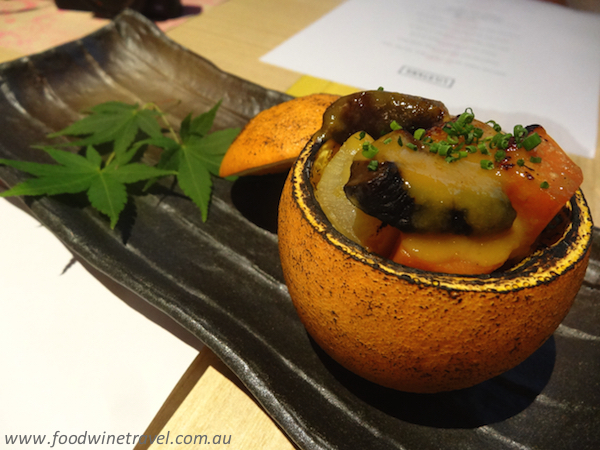 Pumpkin, daikon, carrot and shiitake mushrooms are cooked individually in miso and served in a hollowed out orange, an interesting dish that creates plenty of wow factor. Nagoya style quail kara-age with sweet sansho soy. The quail is marinated overnight in milk, before being fried (kara-age is a Japanese technique for deep-frying in oil). The succulent quail is a knockout with the sweet soy sauce flavoured with sansho, or Japanese pepper. 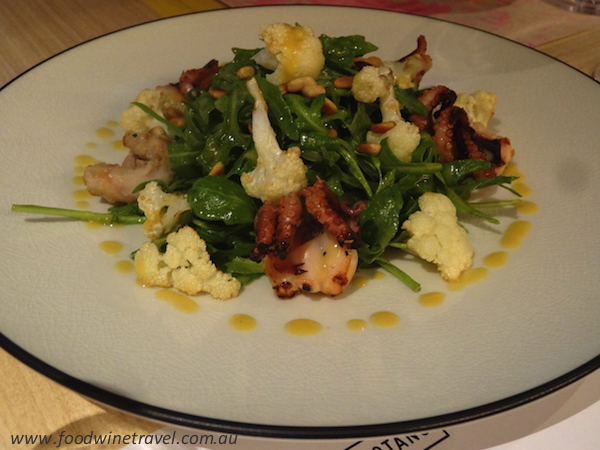 Chargrilled baby octopus and rocket with karashi su miso. The octopus is marinated in black soy, ginger and sake overnight, then served with karashi, a Japanese mustard. Light and lovely, with a little bit of sweet, a little bit of sour, and some crunch from the cauliflower. Cooked on the robata grill: Chicken thigh with inherited homemade yakitori sauce, Chicken meatball with creamy egg (pictured), Pork belly with yuzu kosho miso, Cauliflower with walnut dengaku miso, Turnip with sansho salt. Heaven is a slow-cooked egg for dipping meatballs in. 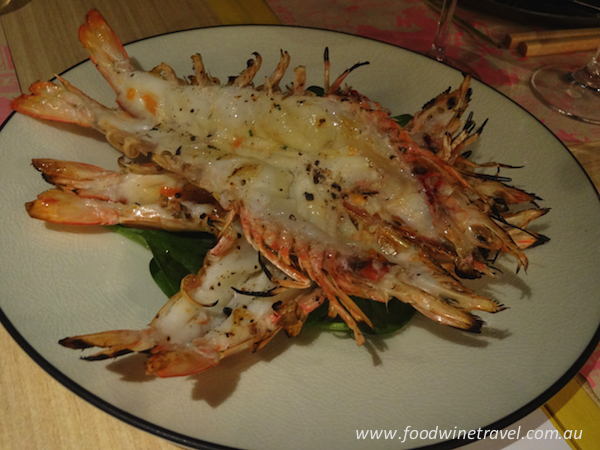 Jumbo chargrilled prawns with shiso amazu. This sweet vinegar dipping sauce is blended with ginger, sesame and shiso, a minty flavoured herb, creating another standout dish. 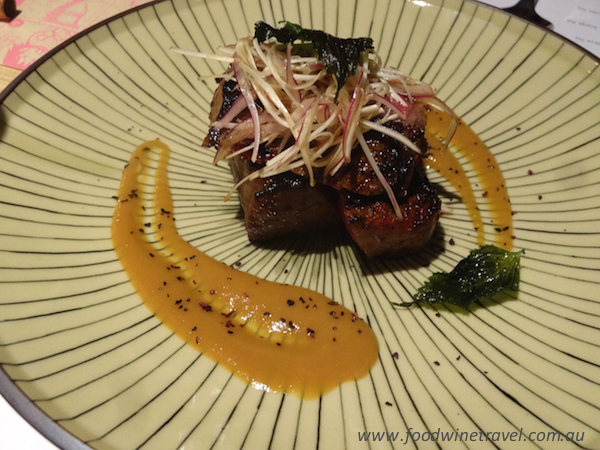 Chargrilled Wagyu sirloin marinated in Japanese herb miso. Miso is cooked with sake and sugar until it reduces to a thick sauce used to marinate the most deliciously tender, marbled Wagyu beef. A dish to knock your socks off! Sticky mochi-mochi tofu with brown syrup and green tea icecream (pictured). 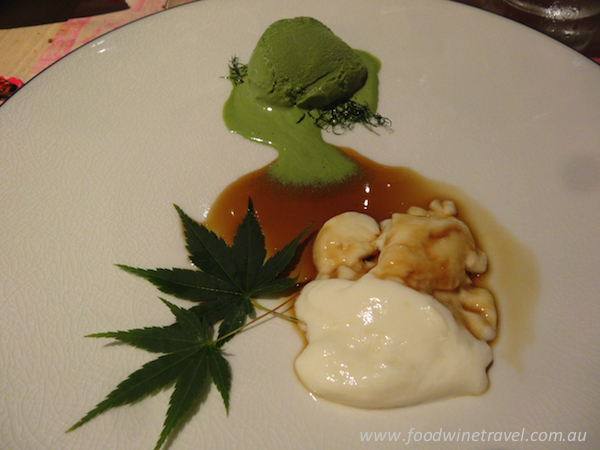 Houji tea “smooth” pudding with sweet potato. It’s just a personal thing but I’ve never cared for the flavour of green tea in desserts and so, accordingly, these two are not on my list of favourite dishes. 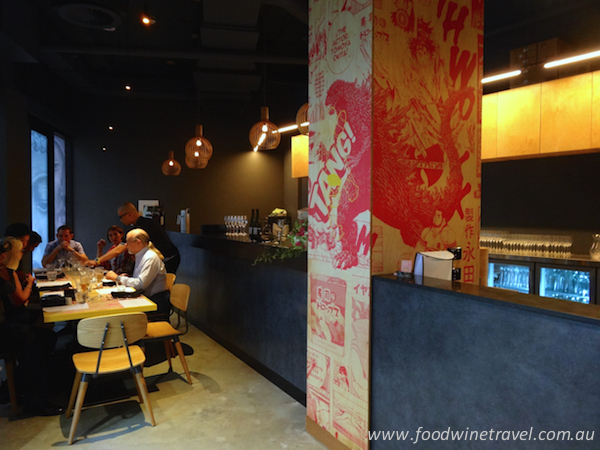 The restaurant has a broad list of beverages, including Grace Wines from Japan, boutique Japanese beers and a huge line-up of 25 sakes. 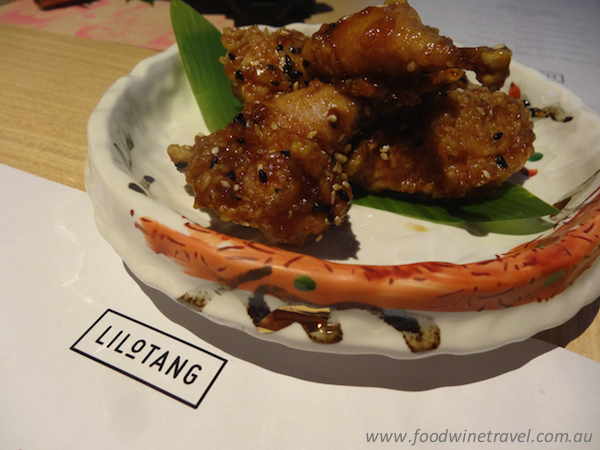 With such thoughtful, well-crafted food and a cool, new space for diners to hang out in, LiLoTang will surely soon be on everyone’s lips. You might also like: Burbury Apartments; Sokyo; Kiyomi. Christine and Maurie dined as guests of LiLoTang and the Doma group. Hi I am a Delhi-based food blogger who loves to write about food and new restaurants from India and around the world. 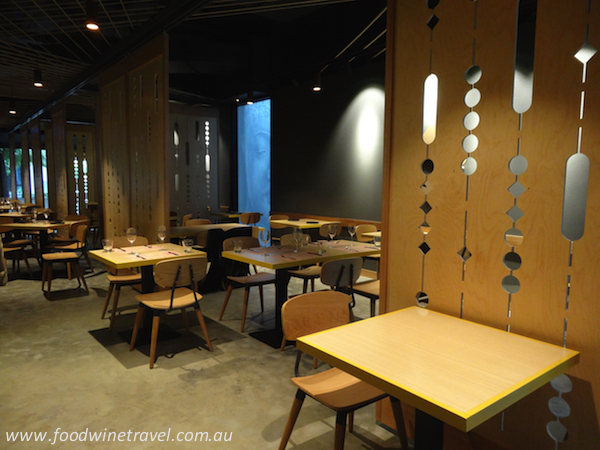 I would request the concerned person to please get in touch so that culinary delites can write about this new restaurant in Australia and let the travellers and foodies around the world let know about this place. I can’t speak for the owners, Swati – will leave it to them to get in touch with you if they want to. 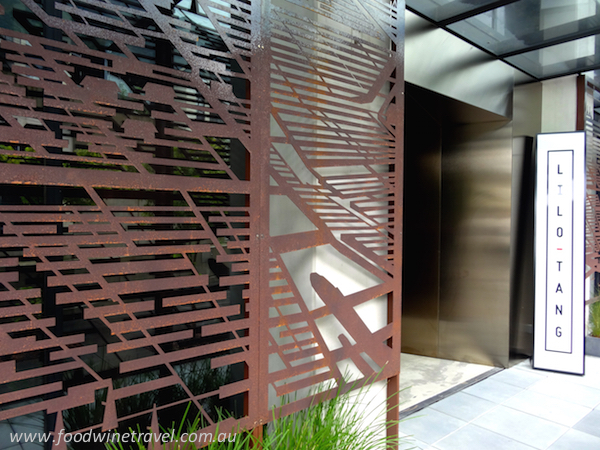 Wednesday Wine Pick: Di Giorgio Family Wines 2014 Shiraz.